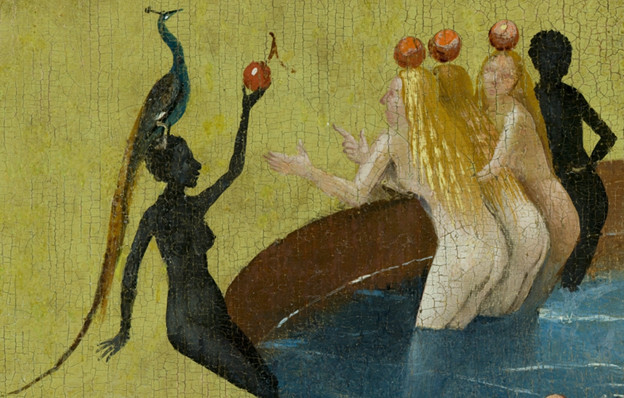 Above: Hieronymus Bosch, 'Garden of Earthly Delights' (detail), via Wikimedia Commons. This essay is conjectural and conversational. Conversational with other texts, other minds; but also among the importantly divergent logics of poetry and discourse, discourse and exploratory essay. Decades ago, skeptical about the force of a strictly woman-centered feminist theory whose reactive stance seemed to corroborate the secondary status of the feminine in the age-old M/F binary, I was struck by the realization of a gender and genre transgressive experimental feminine rooted in embodied female experience but integral to all struggles with the cultural coercions of an ubermasculine hegemony. as ever, controls the girl.